Blockbuster double-header this morning for my News Shapers event series: Bob Woodward, followed by Speaker Ryan! (Outside cameras and correspondents welcome.) If you're in downtown D.C. this morning, please join us at 8 a.m. (doors open 7:45) at AJAX, 1011 4th Street NW (near L Street). 1 big thing: "Autumn of discontent"
Republican leaders are coming to the bleak conclusion they will end summer and begin the fall with ZERO significant legislative accomplishments. Privately, they realize it's political malpractice to blow at least the the first nine of months of all Republican rule, but also realize there's little they can do to avoid the dismal outcome. In fact, they see the next four months as MORE troublesome than the first four. They're facing terrible budget choices and headlines, the painful effort to re-work the healthcare Rubik's Cube in the House (presuming it makes it out of the Senate), a series of special-election scares (or losses) — all with scandal-mania as the backdrop. Axios' all-terrain Jonathan Swan tells me that one of the key insights he picked up at last week's SALT hedge-fund conference in Vegas (tough duty) was that nobody thought healthcare reform would happen, and most were very skeptical that Trump and Republicans could get their acts together enough to pass tax reform this year. Asked about both onstage, Jeb Bush said a flat "no" to healthcare and a very unconvincing "maybe" to tax reform. The masters of the universe had more colorful words in private — they're deeply pessimistic about healthcare. They are in this terrible box on healthcare and they're about to get blamed for it because they did what I've been calling that Bon Jovi rally at the White House — because they were halfway there. Pool report from President Trump at the Vatican today, by the Wall Street Journal's Carol Lee: "When pool entered the room, ... POTUS had already introduced Ivanka Trump, who ... wore a black lace dress and veil, and Jared Kushner. ... Other members of the delegation were still in the back of the room near pool. "The first person pool saw POTUS introduce to Pope Francis was Rex Tillerson. 'This is my secretary of state,' POTUS explained. H.R. McMaster was next. ... Hope Hicks ... [t]hen Dan Scavino, Brian Hook, Keith Schiller and others. "The pope asked Melania Trump, referring to POTUS: 'What do you give him to eat, potizza?' She repeated 'potizza,' which apparently is a Slovenian treat. (Not pizza, as some thought they heard.) 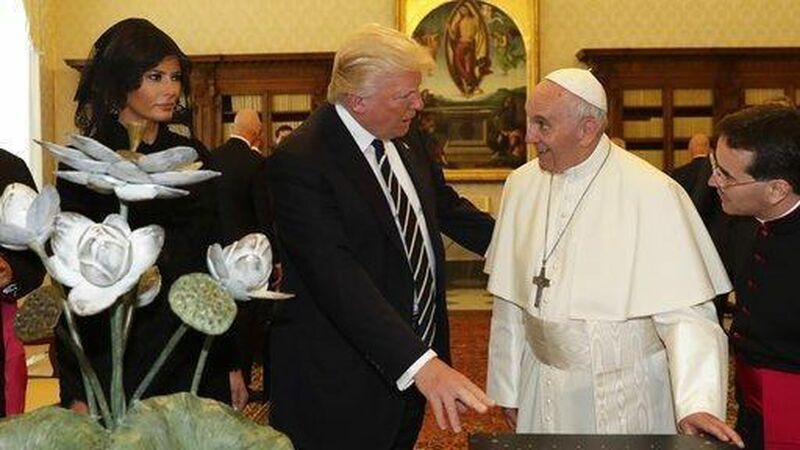 One of the pope's attendants, a clergyman, gave Mrs. Trump a small object, maybe a rosary, as she was walking away (she seemed to have forgotten about it), and she turned back and asked the Pope to bless it, which he did." Information on the gifts POTUS gave the Pope, from the White House: "A first-edition set of Dr. King's writings are presented to Your Holiness on the occasion of President Donald J. Trump's first visit to the Holy See. ... Each book is custom-bound and accented with gold hand-tooling, and 'The Strength to Love' bears Dr. King's signature." "The 'Stone of Hope' statue sits as the centerpiece of the Martin Luther King Jr. Memorial in Washington ... A piece of the monument's granite — a stone of hope — is presented." P.S. From Reuters, "Jared Kushner Is Trump's Main Man On Mideast Peace." 3. "Russia contacts alarmed Brennan"
N.Y. Times Quote of the Day ... John O. Brennan, the former C.I.A. director, testifying before the House Intelligence Committee about his concerns regarding Russian interference in last year's presidential election: "Frequently, people who go along a treasonous path do not know they are on a treasonous path until it is too late." WashPost front page, by Greg Miller: "Brennan said he became increasingly concerned that Trump associates were being manipulated by Russian intelligence services as part of a broader covert influence campaign that sought to disrupt the election and deliver the presidency to Donald Trump." President Trump has retained Marc Kasowitz, his longtime attorney, in the Russia probe. A White House source says Trump feels comfortable with Kasowitz, who will be lead attorney, and that other names could be added to his legal team. Media companies published a record number of Trump-Russia stories last week, according to SocialFlow's study on 300+ news publishers on Facebook. The number of people who actually saw those stories on Facebook was second only to the week BuzzFeed published an unverified Trump dossier, Axios' Stef Kight reports. ... its highest level, meaning more attacks may be imminent. ​"The man who carried out a suicide attack in Manchester was "likely" to have not acted alone ... Police arrested three men in south Manchester" today. The White House budget released yesterday appears to have double-counted more than $2 trillion in estimated tax revenue, Axios' Dan Primack writes. Why it matters: That means the budget would not balance over 10-years (as promised), even if the U.S. economy were to hit sustained 3% growth (as projected by the White House, but by very few others). The problem: Trump's budget anticipates around $2.06 trillion in extra federal revenue over the next decade, based on the aforementioned increase in economic growth. That new money then would be used to offset Trump's proposed tax cuts, as the administration previously said that the tax cuts would be revenue-neutral. Unfortunately, that same $2 trillion also is earmarked for closing budget gap. The response: Trump budget director Mick Mulvaney was asked about the double-count during a press briefing. First he blamed the Obama administration for its own faulty economic projections — former Clinton Treasury Secretary Larry Summers had just raised the double count on the WashPost's Wonkblog. Mulvaney: "We did [the double count] on purpose... I'm aware of the criticisms and would simply come back and say there's other places where we were probably overly conservative in our accounting. We stand by the numbers." P.S. Hillary Clinton, honored in New York by the Children's Health Fund, said the budget "shows an unimaginable level of cruelty and lack of imagination and disdain for the struggles of millions of Americans, including millions of children. ... None of us can remain silent in the face of these attacks." "Google has begun using billions of credit-card transaction records to prove that its online ads are prompting people to make purchases — even when they happen offline in brick-and-mortar stores." "The advance allows Google to determine how many sales have been generated by digital ad campaigns, a goal that industry insiders have long described as 'the holy grail' of online advertising." "Google already analyzes users' Web browsing, search history and geographic locations, using data from popular Google-owned apps like YouTube, Gmail, Google Maps and the Google Play store. All that information is tied to the real identities of users when they log into Google's services." Why it matters: "Google is yet again treading in territory that consumers may consider too intimate and potentially sensitive." Big read on Wall Street Journal front page, "Google vs. Uber: How One Engineer Sparked a War — Anthony Levandowski started outside tech companies while working for Google, which alleges he took driverless-car secrets to a competitor." "The typical CEO at the biggest U.S. companies got an 8.5% raise last year, raking in $11.5 million in salary, stock and other compensation last year, according to a study by executive data firm Equilar for The Associated Press. That's the biggest raise in three years." "The bump reflects how well stocks have done under these CEOs' watch. Boards of directors increasingly require that CEOs push their stock price higher to collect their maximum possible payout, and the Standard & Poor's 500 index returned 12% last year." "Female CEOs once again saw bigger pay raises last year than their male counterparts, but they continue to account for only a small percentage of the overall ranks." PBS "Frontline" just posted "Bannon's War": "The inside story of Trump adviser Stephen Bannon's war — with radical Islam, Washington and White House rivals." Prime times to Netflix and chill: "[G]lobal Netflix data released exclusively to USA Today shows that ... [v]iewers are more likely ... to watch comedy in the morning, and ... documentaries between midnight and 6 a.m. than at other times. The habits change around the world — in Spain and Portugal, for example, horror viewing is up between 2 and 4 p.m., but in the U.S., the genre peaks around 9 p.m."
Bonus: "Trump bits helped make SNL's ratings great again," per the cover of WashPost Style section: "On Saturday, SNL concluded its most-watched season in 23 years."